Everyone knows that membership sites are a must have component of every online business in order to generate long term recurring income. The problem is that building a membership site is tough (especially for the technically challenged). There are so many plugins and themes available that it’s difficult to choose the right one. OptimizePress 2.0 is a great theme but it has a steep learning curve and can be time consuming to use for membership sites. Enter the MemberSonic 2.0 Theme. We designed it so that we could set up membership sites quickly and be flexible enough to be an all in one WordPress theme. It’s the perfect compliment to any membership site (and it will even fit nicely behind the OptimizePress plugin version – to save you valuable time in setting up your sites). But the real power of our theme lies in the enhanced menu navigation and display features built right into the MemberSonic theme. Our MemberSonic Theme 2.0 has everything you need to create a truly customizable brand and workflow for any membership site. You can easily change the way your site looks, or what menus are displayed on what post/page. This could be the last theme you will every have to purchase for your membership site. We will run a contest where all customers of our MemberSonic theme have an opportunity to submit their sites to us. Not only does your site get listed in our “Customer Showcase” (optional), but we will select who we think has created the best site using our theme… and the winner will receive $100 directly to their PayPal account! Our MemberSonic Theme coupled with these bonuses make this a complete toolkit for every membership site owner and developer. We’ve spent countless hours of development time and will continue to invest into our membership site products in order to deliver new value added features that will our customers create stunning and fully functional membership sites. But don’t wait, because this special pricing won’t last long. In fact, the price increases with every sale, and after the 7 day launch period the price will increase to $37 where it will sell all day long. Question: Does the MemberSonic theme protect content? Answer: No. Our theme is not a membership site in itself. 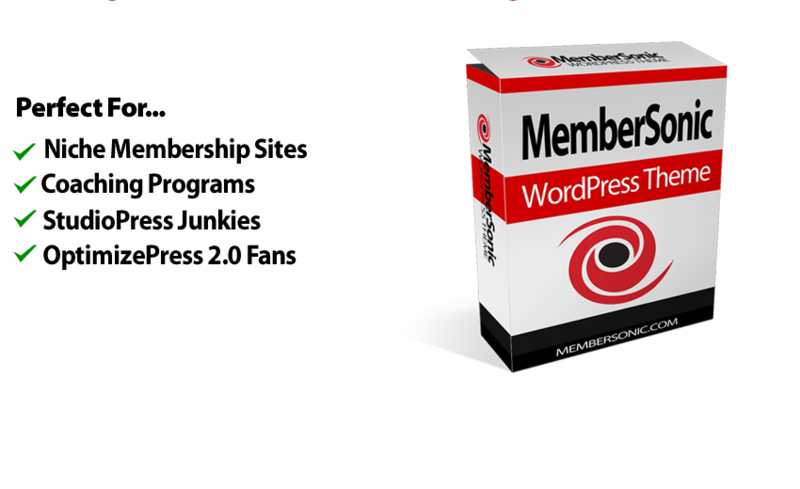 You still need a membership site plugin like our MemberSonic Pro, Wishlist Member, Digital Access Pass, etc to protect and deliver your content. 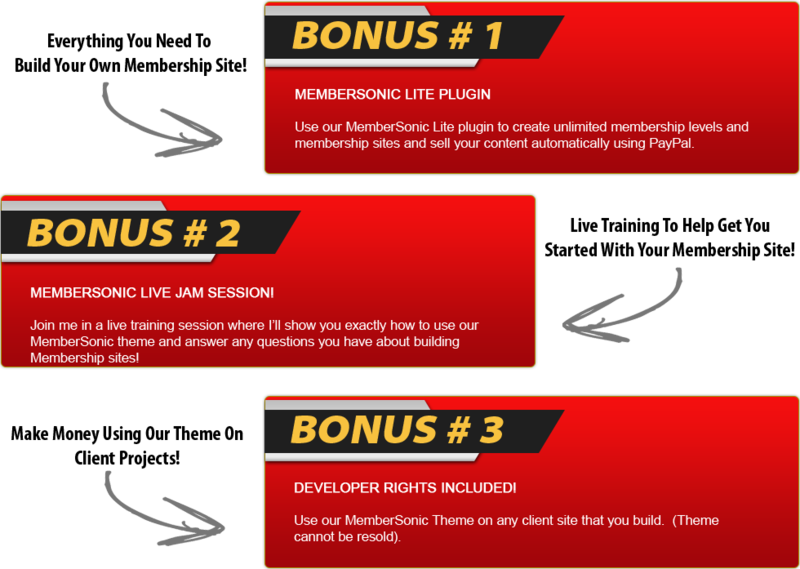 That being said, one of our bonuses is our MemberSonic Lite plugin, which will protect your content and allow you to sell it through PayPal. Question: How does this them compare to OptimizePress 2.0? Answer: Our MemberSonic theme is NOT a replacement for OptimizePress. OptimizePress has a broad depth of sales funnel features that go far beyond the functionality of our theme. 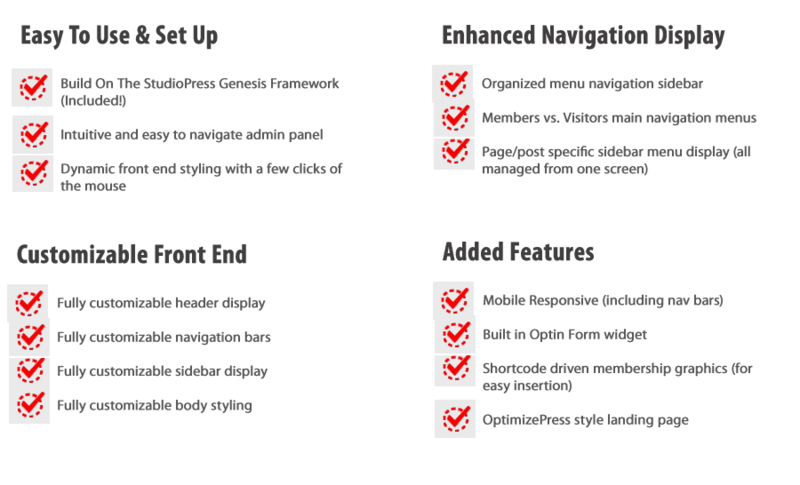 However, our theme has unique navigation features not found in any other theme including OptimizePress. In terms of pricing, our theme is an alternative to OptimizePress for membership sites that require a basic sales page to sell their products/services. Question: Can you show me a site where you are running the theme? Answer: The site you are viewing now runs MemberSonic 2.0 (click here to see the blog page). Keep in mind that because of the styling functionality, you can make the site look dramatically different so it’s difficult to provide a demo site that show how different it can look. The advantage to that is that if you are running the OptimizePress 2.0 plugin to create sales pages, you could use our theme on rest of the pages/posts (this will be a huge time saver) and have them look very similar to the sales page layout of OptimizePress. Question: Who is Plugin Results? Plugin Results is founded by Andrew Hunter, CEO of Process Driven Results Inc. Our company strives to provide our customers with software products that deliver results in their business. Our product line focuses on creative solutions aimed at streamlining business processes for online entrepreneurs. We specialize in WordPress applications and desktop solutions that integrate with many of the leading eCommerce platforms used by most online entrepreneurs today. If you need support or have any questions, please click on the ‘support’ link below and we will be happy to assist you.